You've invested the time and money to set up your business or nonprofit and now it's time to tell the world about it, but where to begin? You know your website should be optimized (whatever that means) and you know you should be "doing" social media, but it all feels a little vague and overwhelming. Email marketing? Is that good? What about video? And what is "link building" anyways? Through working on hundreds of projects I've developed a simple, step-by-step method for creating a cohesive online presence. Based on your audience and market we'll generate a list of things to do to attract and convert visitors. You then get a custom plan for working through that list item by item. Marketing is a long term endeavor kind of like fitness. In the same way that eating right and walking makes you healthy, applying simple best practices on a regular basis builds a healthy online presence. The Marketing Action Plan (M.A.P.) leaves all the lingo aside and gives you a complete plan, breaking it all down into doable steps. A Strategic Marketing Evaluation Guidebook: I begin with a thorough review of your current online assets (website, social media profiles, local search listings), take a look at your closest online competitors, and then provide a detailed report with specific recommendations covering everything from branding to search engine optimization (SEO) to conversion optimization (the art of turning visitors into buyers). This gives you a complete understanding of the current state of your online presence along with an easy-to-understand, step-by-step prioritized list of things to do improve based on your specific business, industry, audience and market. Depending upon your level of knowledge you can implement these recommendations yourself or follow up with me or another professional to get them accomplished. Expedition Poster: a poster that help you stay focused and motivated. On one side you have an Action Item Calendar that breaks the project down into small steps. The other side has a Progress Map where you can see the whole journey and mark off milestones along the way (like earning scout badges). There is magic in seeing the beginning, marking progress as you go and visualizing the finish line. Motivational Stickers! Yep. I don't know about you, but I'll take all the help I can get. The stickers are designed to make it fun and keep you motivated. Use them to plan out your due dates on the Calendar side and mark your progress on the Map side. Upon receiving your order I'll start your Strategic Evaluation Guidebook and contact you to schedule our 1 hour info-gathering session. In the session we'll cover a wide range of particulars about your current marketing, your goals, ideas and more. Using that information I'll complete a thorough review of your current set up and generate your custom recommendations. I'll then put your full packet in the mail. Let me know about what, if anything, you have so far and I'll get back to you with an estimate and next steps. Facebook Business page, Yelp listing, LinkedIn profile, etc. With a complete overview of your marketing you can see what tasks you can do yourself and what items you should outsource. Prioritizing your marketing breaks it down into doable steps where you'll make progress every week. Having a an online presence is a business essential but it has to be fresh, cohesive and compelling to be effective. By taking simple steps over time you transform your online presence to attract visitors and convert them to clients. The Marketing Action Plan is your complete, step-by-step guide (with motivation!) and puts you immediately on a path moving forward. Prefer to Do It Yourself? Get the Marketing Action Pack DIY Kit! The Marketing Action Pack DIY Kit is a simplified version of my full-service Marketing Action Plan. 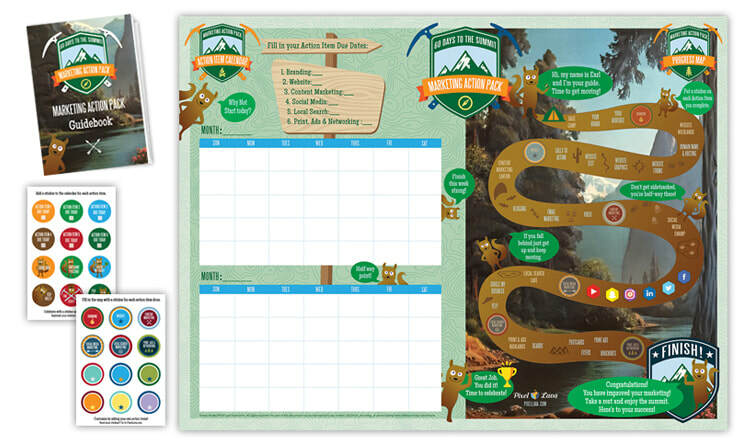 You get a fillable Guidebook, the blank Action Item Calendar and Progress Map Poster and the motivational stickers. This is a do-it-yourself kit so it does not include the Strategic Evaluation with customized recommendations. If you're ready to get on track but working on tight budget, this low-priced kit is a great place to begin. Buy online.